It’s been a tough start for the Golden Knights and everyone is aware. Players are scratching their heads, fans are panicking, and some are flipping their lids. Heck, I can’t even keep Ken under control (but honestly, he’s not wrong in his premise). 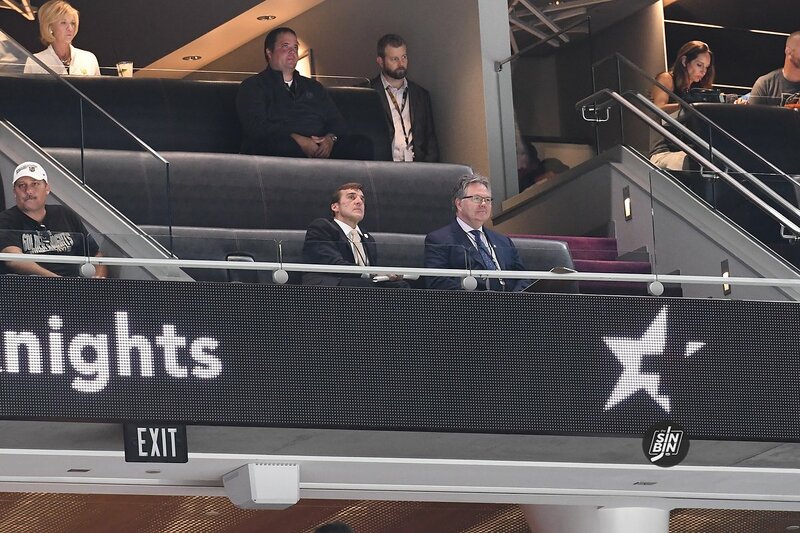 With only 19 points in 22 games, the pressure is starting to build, but the Golden Knights front office remains cool and collected despite the sluggish start. During the Flames pregame show, Vegas assistant General Manager Kelly McCrimmon discussed his team’s disappointing first quarter of the season. While concerned, the second man in charge wasn’t shocked by the Golden Knights early struggles. Of course, it’s not the start the Golden Knights front office expected but they still feel confident in their club, and they are definitely not feeling the heat from the fans and whack-job bloggers writers who cover the team. The Flames studio host asked McCrimmon an interesting question about the Max Pacioretty trade. The question simply was, did the Pacioretty trade get done because of the 2017-18 Golden Knights cup run? Always thinking forward, McCrimmon assured fans the organization is focused on today, and tomorrow. Lastly, the assistant GM doubled-down on the Golden Knights team’s playoff quest. The reason for his confidence is one we’ve all discussed. After the blowout loss in Calgary, I’m sure McCrimmon and his contemporaries are concerned. Rightly so, but one thing of note, the assistant GM sounded calm and frankly unconcerned with his team’s slump. Which could be a good sign for fans. Geeting points in the NHL is hard! I hate to say it, but maybe Reilly Smith needs to sit a game. This pains me as I spent months last season observing our roster to choose whose jersey I was going to wear and I chose Smith for his work ethic and smart 200 foot game. He has not been the same this season, except in brief flashes. I don’t know if he is hurt or not conditioned but he looks a step slow and weak on the puck often. What are your thoughts on Malcolm Subban? At some point your backup goalie needs to be contributing wins and that has not happened yet this season. Hasn’t had a win since 04/03/18 @ Vancouver, hasn’t played in a game in which we won decisively since vs Vancouver on 03/20/18, has not had a start in which we won decisively since 12/31/17 vs Toronto. 0-4 4.03 GAA .859 SV%…not good, time for a call up? red wings made playoffs for 25 straight seasons, they had picks, free agents, depth and owner with deep pockets. What stats are you looking at? Goals, assists and +/-? Mcnabb is leading the team in blocked shots and by a fair margin. His TK/GV is ok and CF% eh. He is a defensive minded defenseman and his stats reflect this. He has also been paired with Miller the majority of the season and he is always going to defer to Miller in the offensive zone. Theodore is a bit puzzling. His offensive production for a defensemen is acceptable. He is leading the team in takeaways and that generates scoring chances and is also not giving away the puck often. His CF% is good but for some reason pucks seem to end up in our net when he is on the ice. Engelland plays very conservatively and you can say that he hasn’t been much of a factor. Nothing in his analytics jumps out at me as a major positive or negative. Yes he can play better? Pacioretty’s individual PDO would tell us that he has been extremely unlucky, he is multiple standard deviations away from mean. The second line is starting to click though. I think we will see a drastic increase in points production for him. No arguments on Nosek and Carpenter. The third line has been atrocious. Subban has not looked good since the end of last year (not season) in my opinion. The last time he started and won a game with a margin of victory of more than one goal was against Toronto on 12/31/17. Making smart plays on the ice. All players mentioned need to do better.